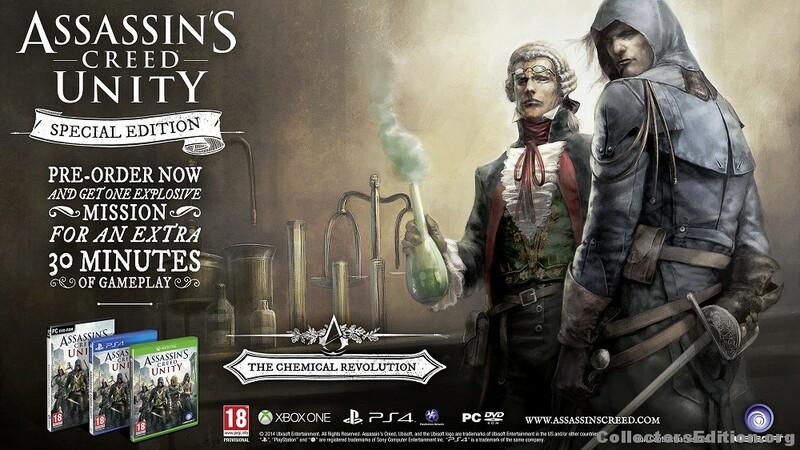 One exclusive single player mission (30mins): Chemical Revolution. Paris, 1789. The French Revolution turns a once-magnificent city into a place of terror and chaos. Its cobblestoned streets run red with the blood of commoners who dare to rise up against an oppressive aristocracy. Yet as the nation tears itself apart, a young man named Arno will embark upon an extraordinary journey to expose the true powers behind the Revolution. His pursuit will throw him into the middle of a ruthless struggle for the fate of a nation, and transform him into a true Master Assassin. Introducing Assassin’s Creed® Unity, the blockbuster franchise’s new chapter powered by the all new Anvil engine, rebuilt from the ground up for new gen. From the storming of the Bastille to the execution of King Louis XVI, experience the French Revolution as never before – and help the people of France carve an entirely new destiny. Embark on Ancestral Missions, Treasure Hunts, Murder Mysteries, Contracts and more. The city is packed full of activities that will captivate you for hours Witness the chaos of the French Revolution first-hand by immersing yourself in realistic, systemic crowds of up to 5,000 AI driven characters. Available Languages: EN, DE, ES, FR, IT Forza Motorsport 5 is a cinematic automotive journe.. Available Languages: EN This is a Cd Key that you can redeem to your own account! :) Whe.. Available Languages: Multilanguage (check steam product page for more details) When time br..